7. New BTV Serotypes and no End? In Loeffler’s Footsteps – Viral Genomics in the Era of High-Throughput Sequencing, Volume 99, the latest in the Advances in Virus Research series, contains new information on the topic, with chapters covering Loeffler 4.0 – diagnostic metagenomics, Detection of a novel orthobunyavirus by metagenomic analysis – the situation after five years, New Squirrel and Rodent Viruses Detected by NGS, Astroviridae – A Growing Family, New Leaves in the Growing Pestivirus Tree, New BTV Serotypes and no End?, and The recently discovered Bokeloh Bat Lyssavirus - Evidence for its continued transmission in Europe. 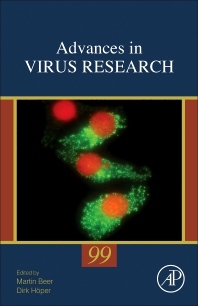 First published in 1953, this series covers a diverse range of in-depth reviews, providing a valuable overview of the current field of virology. The series is a valuable resource for information on all topics of virus research, from bacteriophages to human viruses, with this volume focusing on genomics.